I love apple pie, but unless it’s an extra special occasion, I’m adverse to chilling and rolling out dough for a pie crust. Apple Muffins are a quick and easy way to satisfy your apple pie craving with less effort and all of the benefits. These tender muffins are stuffed with baked apples, cinnamon, and other apple pie spices, and the muffin top is slightly crunchy due to the caramelized brown sugar. 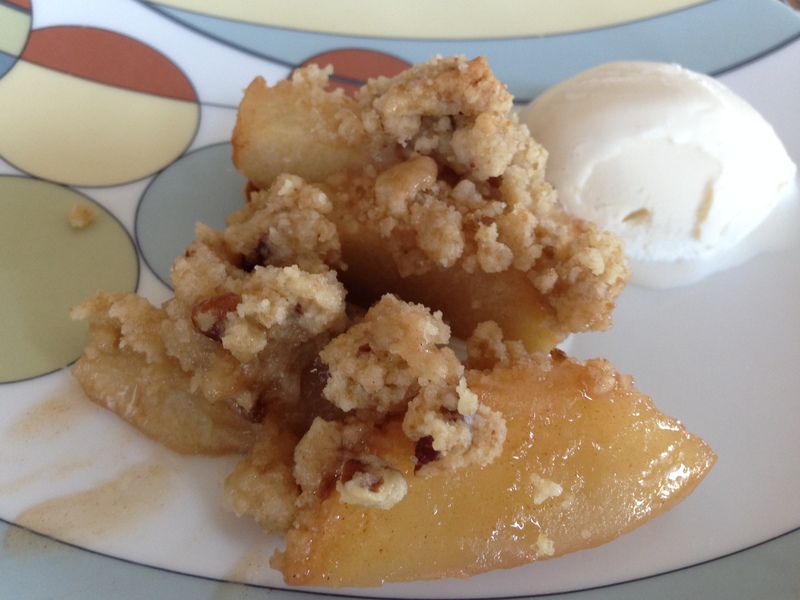 If you split a muffin in half and top it with vanilla bean ice cream (Häagen-Dazs makes a good one), you have your own delicious version of apple pie a la mode. 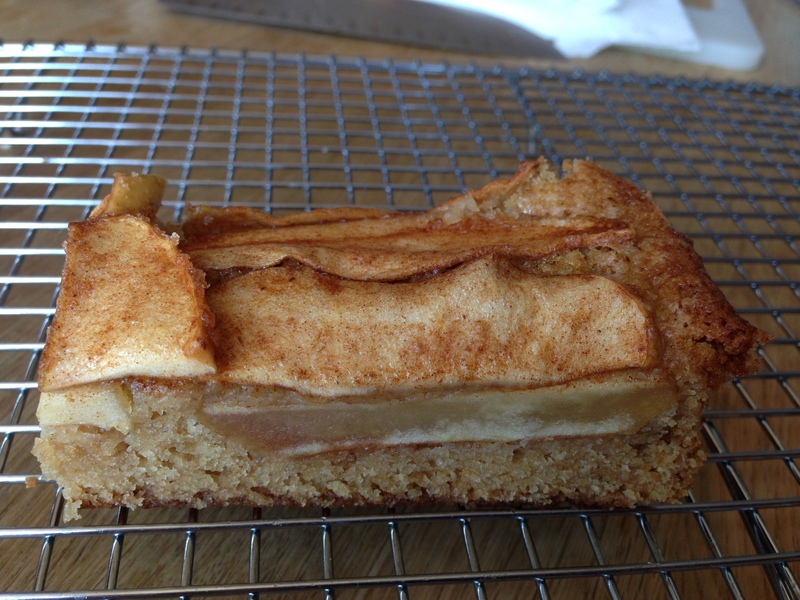 A cross section view of the muffin with baked apple chunks bursting out. Grease and flour a 12-cup muffin pan, or line with papers and lightly grease the insides of the papers. Mix together the butter, granulated sugar, and 1/4 cup of the brown sugar, beating until fluffy. Add the egg and mix well, stopping once to scrape the sides and bottom of the bowl. Gently mix in the buttermilk or yogurt. In a separate bowl, stir together the flour, baking powder, baking soda, salt, and cinnamon. Then mix into the wet ingredients until just combined. Do not overmix to keep the muffins tender. Fold in the chopped apples. Divide the batter evenly among the prepared muffin cups, sprinkling the remaining 1/2 cup of brown sugar on top. Bake the muffins for 25 to 30 minutes, or until a toothpick inserted into the center of a muffin comes out clean. Remove the muffins from the oven, cool them for 5 minutes in the pan, then turn them out onto a rack to finish cooling completely. 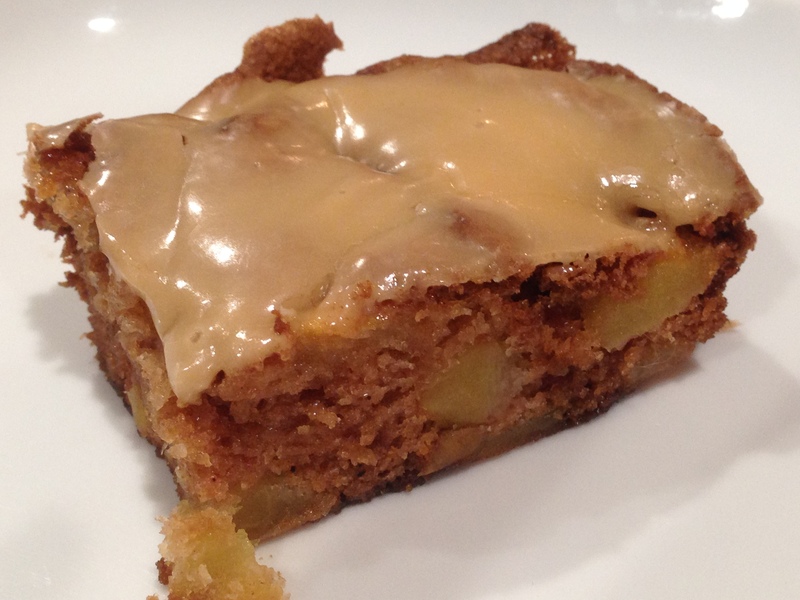 If gingerbread and apple pie merged to form a more perfect union, they would have created this Apple Cake. This moist cake is bursting with cinnamon, nutmeg, and ginger, and full of chunky, tender apples. The Boiled Cider Glaze adds even more depth to the rich apple flavor. The cake and glaze are easy to throw together and are a great way to make use of those bushels of apples from you recent apple picking adventure (and it doesn’t matter if it occurred in the grocery store or at an orchard). My notes are in [ ]. Preheat the oven to 325°F. Grease and flour a 9″ x 13″ pan. In a large bowl, thoroughly combine the flour, baking soda, salt, cinnamon, nutmeg, ginger, and cake enhancer (if using). Set the bowl aside. In the bowl of a mixer, beat the butter and sugar together until lightened in color and well combined. Add the eggs, one at at time, to the butter-sugar mixture, making sure to incorporate each one before adding the next one. Add the flour mixture to the wet ingredients, and beat until well combined; the mixture may seem very stiff, and may even be crumbly. Add the apples and nuts (if using), and mix until the apples release some of their juice and the stiff mixture becomes a thick batter, somewhere between cookie dough and brownie batter in consistency. Spread the batter in the prepared pan, smoothing it with your wet fingers. Remove the cake from the oven and place it on a rack to cool completely; don’t remove the cake from the pan. Stir all of the ingredients together, using the lesser amount of cream. Add additional sugar or cream if needed to make the glaze the consistency of molasses. Pour the glaze over the cooled cake and spread. It’s fall, and everyone seems to be losing their minds over pumpkin spice. But in my little corner of sweets, I’m all about the apples, and nothing captures the apple spirit better than these Apple Cider Caramels. They’re a cross between a caramel apple and an apple pie. 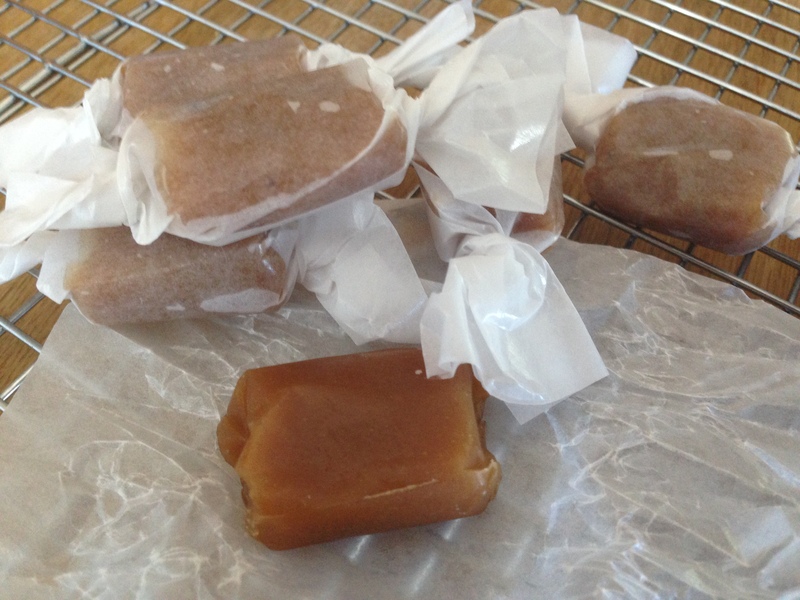 Boiled cider makes these caramels extra apple-y and is worth the investment. Note, in the past I’ve tried boiling down some apple cider to make boiled cider, but it turned into a big gooey, sticky mess, so now I just stick with purchasing my boiled cider. My comments are in [ ] below. Combine the cream, corn syrup, sugar, butter, and boiled cider in a heavy-bottom, deep saucepan. Bring the mixture to a boil over high heat, stirring to dissolve the sugar. Reduce to medium-high heat and cook until the mixture reaches 248°F on a candy thermometer, 20 to 30 minutes, depending on your particular stove. Remove the pan from the heat; stir in the salt and spice. Whenever I have friends visiting from out of town, I always want to send them home with some type of baked good to help extend their feeling of being on vacation. 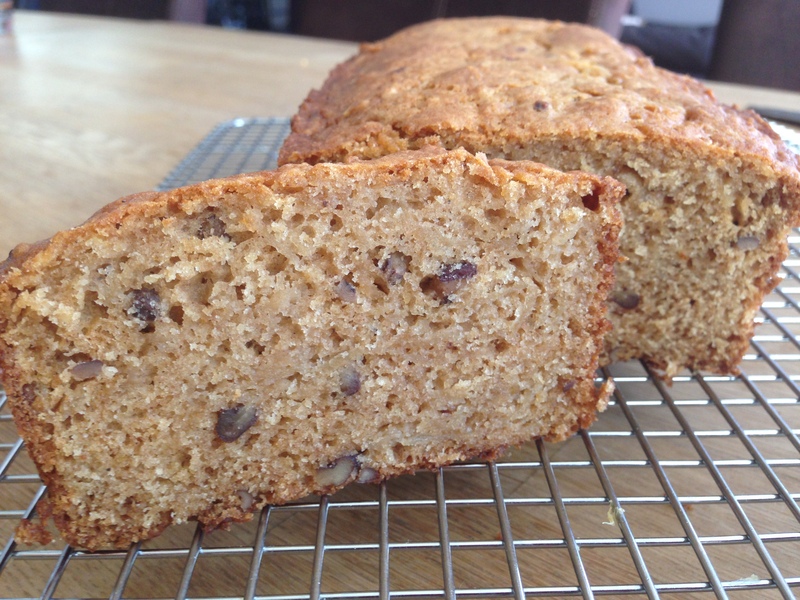 This delicious Apple Pecan Quick Bread is perfect because it stays moist and fresh for 5 to 7 days, and it travels well. It’s not too sweet (perfect for a quick snack at the airport while waiting for a flight) and crammed full of apples, pecans, and all sorts of spices like cinnamon, cloves, cardamom, and ginger (to bring back memories of a homey visit). Spray with baking spray with flour (or butter and flour) an 8×4-inch loaf pan. In a medium bowl, whisk together the flour, baking powder, cinnamon, ginger, cardamom, baking soda, and cloves. In a large bowl, whisk the sugar, eggs, lemon zest, and salt until the mixture is pale yellow and the sugar has dissolved, 1 to 2 minutes. Add the oil and molasses to the wet ingredients, and whisk until smooth. Using a silicone spatula, stir in the apple and pecans. Fold the dry mixture into the wet ingredients until just combined. Scrape the batter into the prepared pan, and level the mixture by tapping the pan on the counter. Transfer the pan to a rack and let cool completely. Invert the bread and remove the pan. The bread will keep, wrapped in plastic, at room temperature for 5 to 7 days. Have you ever read a book where the characters were eating something or talking about eating something, and you wish you too could taste what they were eating? Recently I started reading a book set in a small German village in the 1800’s in which three sisters had recently lost their father, and the only thing that made them feel a bit better was eating an apple cake that a neighbor had dropped by. 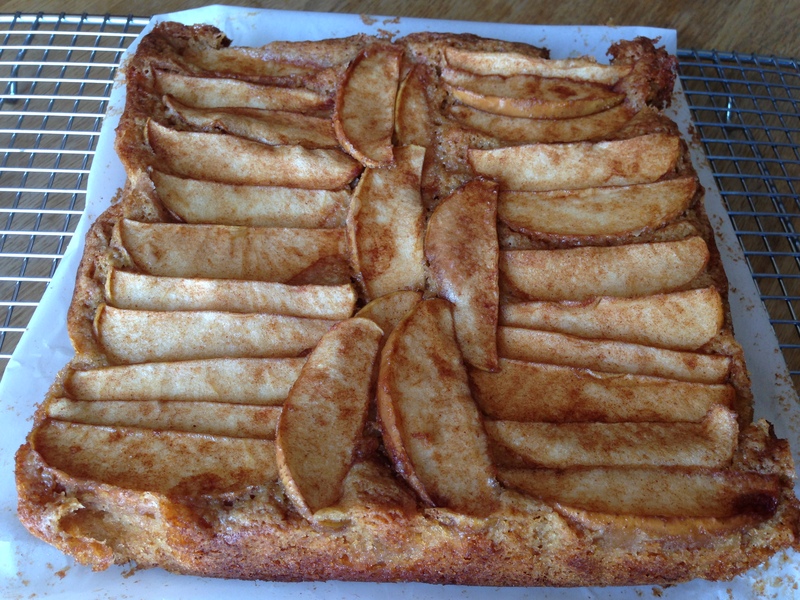 After searching through many German apple cake recipes online, I settled on one that I imagined would have appeared in the book. Although I have my doubts about whether the apple cake recipe I found is a) German and b) historically accurate, I’d like to imagine that it’s delicious enough to raise anyone’s spirits. It’s easy to make (no mixer needed), and you only need one apple. And it’s comfort food at it’s best with spicy cinnamon, layers of tender apples, and a moist cake. Cut parchment paper so that it’s about 2 inches larger than the pan. Line an 8-inch cake pan with parchment paper, allowing the paper to extend over the edges. Lightly the parchment paper with butter or cooking spray. Set aside. In a medium bowl, whisk together flour, baking powder, salt, cinnamon, and nutmeg. Set aside. In a large bowl, cream together softened butter, brown sugar, and granulated sugar. Add eggs and vanilla to the butter and sugar mixture. Mix until combined. Add the flour mixture to the wet ingredients and stir until just combined. Transfer the batter to prepared cake pan. Use the back of a spoon or a mini offset spatula to evenly distribute the batter in 8-inch square pan. Set aside while making the apple topping. In a small bowl whisk together sugar and cinnamon. Add sliced apples. Toss to coat in cinnamon-sugar mixture. Arrange apple slices on top of batter in the pan in desired configuration. I like to overlap the apple slices, making sure to cover all of the batter. Bake the cake for 40-45 minutes until toothpick inserted in center of cake comes out clean. Let cool in pan for 10 minutes. Unmold by lifting excess parchment paper overhang. Allow to cool on wire rack. Serve warm or at room temperature. My baking buddy and I started working our way through her stash of Honeycrisp apples by making a Rustic Apple-Cinnamon Tart, but we quickly realized that we would need to make two apple desserts to fully use up all the apples. 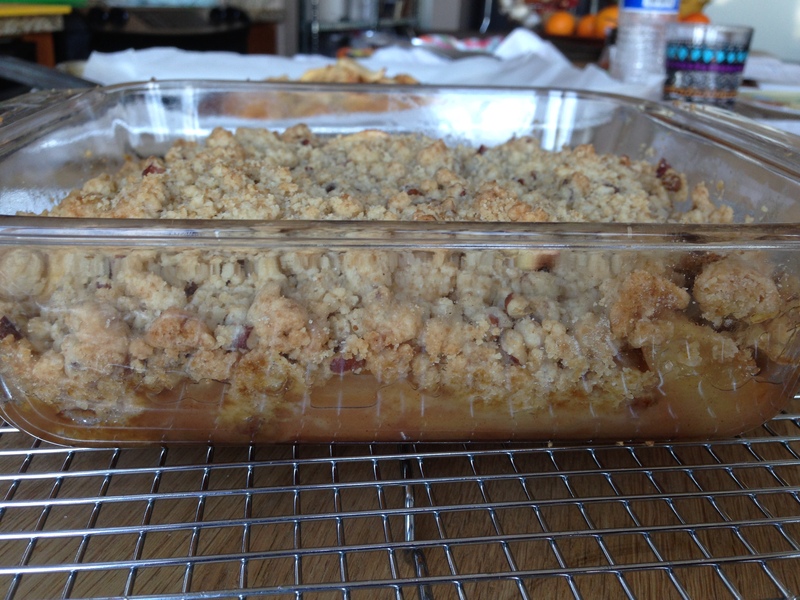 So, this Apple Crisp turned out to be the the surprise of the afternoon. A couple of things stand out to elevate this from your usual apple crisp recipe including: 1) the addition of nutmeg in the topping (which gives it a “je ne sais quois” quality of deliciousness), 2) adding the topping in two stages of baking (which keeps the topping from sinking into the crisp too much and keeps things crunchy), and 3) the use of almond extract instead of the usual vanilla extract (which gives it an extra unique apple pie flavor). From overhead the apple crisp doesn’t look too impressive. The side view looks a bit more intriguing as you get a glimpse of the apple. Scoop into it and the mystery starts to unfold. And here’s the perfect bite for you (with vanilla ice cream). Combine the flour, brown sugar, granulated sugar, salt, and nutmeg in a medium bowl. Rub in the butter with your fingertips until it’s well blended and the mixture crumbles coarsely; it should hold together when you pinch it. Mix in the pecans with your hands until it’s well-distributed. Refrigerate the topping until needed. Put the apples in a large bowl. Sprinkle up to 1/3 cup sugar over the apples (for sweet, ripe fruit, use less; for tart fruit, use more). In a small dish, dissolve the cornstarch in the lemon juice. Pour over the apple and sugar mixture. Add the almond extract and cinnamon and toss gently. 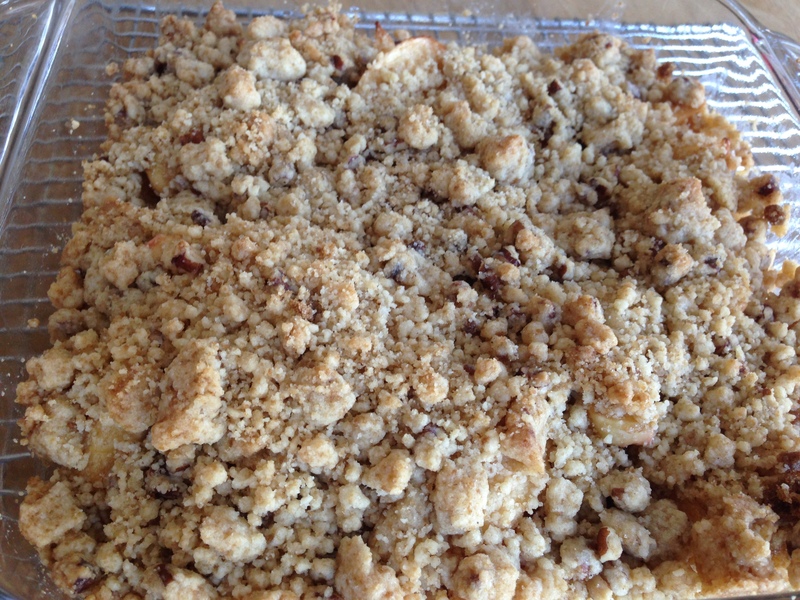 Pour the apple mixture into a 9-inch square (or similar-capacity) glass or ceramic baking dish. Set the pan on a baking sheet to catch overflowing juices. Sprinkle the remaining topping over the crisp, and continue baking until the fruit is tender when pierced with a knife, the topping is crisp, and the juices are bubbling, about another 15 minutes. 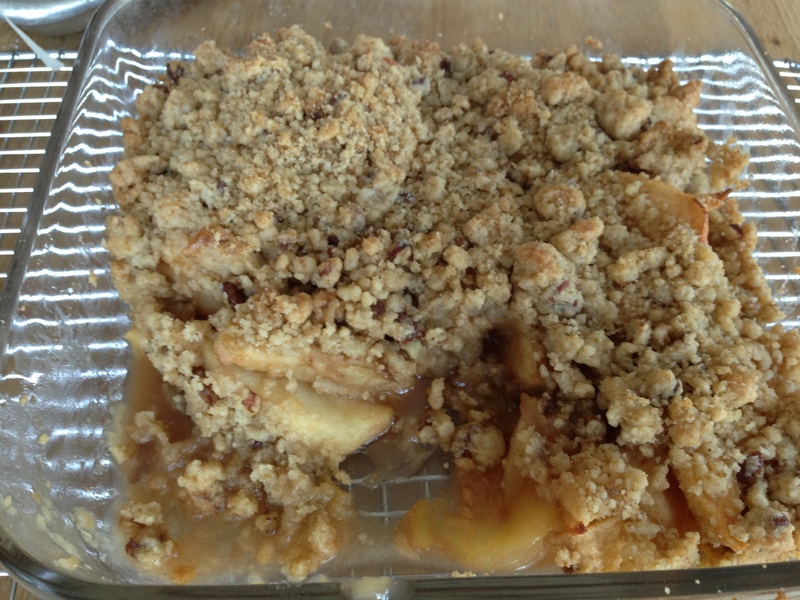 Today was a “bake with a buddy” day, and my buddy brought over a big stash of Honeycrisp apples. The first thought was to make an apple pie, but I tend to be intimidated by making homemade pie crust. So, this Rustic Apple-Cinnamon Tart seemed more manageable because even though it involves making a pie crust from scratch, there’s lots of room for error due to it’s “rustic” nature. And boy, did it look rustic as we put it in the oven to bake. 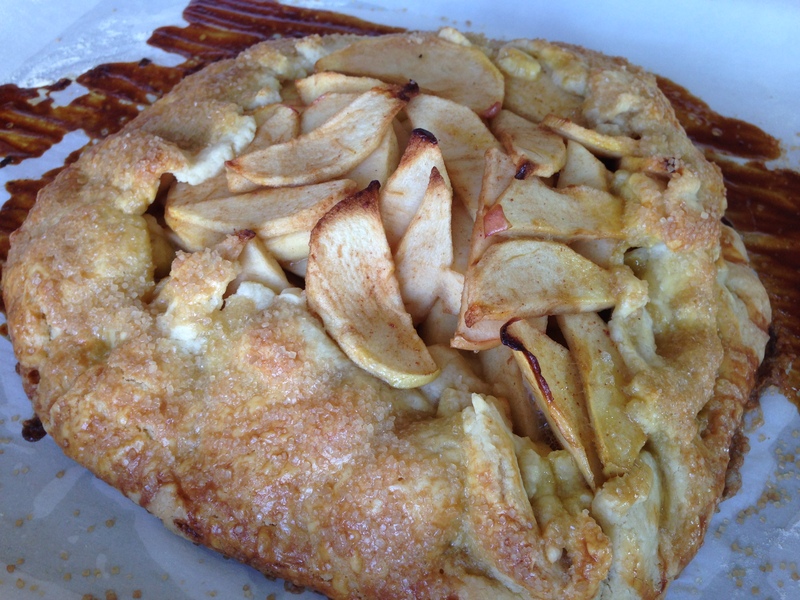 Prior to baking, the apple pile in the center of the tart looked messy, and the crust looked clumsily formed. But somehow when it came out of the oven, the tart transformed into a fabulously delicious dessert. The crust is light, flaky, and crunchy (due to the sprinkling of the turbinado sugar prior to baking), and the tender apples really shine through with their flavor. This tart is especially perfect for those who want a lighter (and less goopy) version of apple pie. Combine the flour, sugar, and salt in a stand mixer fitted with a paddle attachment (or if mixing by hand, in a medium bowl). Cut the butter into 1/2-inch cubes and add them to the flour. On low speed, mix the butter and flour until the flour is no longer white and holds together when you clump it with your fingers, 1 to 2 minutes. If there are still lumps of butter larger than the size of peas, break them up with your fingers. Run a spatula along the bottom of the bowl to loosen anything stuck to the bowl. (If mixing by hand, mix with a pastry cutter or two forks until the butter is mixed into the flour as above). In a small bowl, mix the egg yolk and milk and add them to the flour mixture. On low speed, mix until the dough just comes together, about 15 seconds; the dough will be somewhat soft. (If mixing by hand, add the yolk mixture to the flour and mix gently with a fork until the liquid is well distributed.) The dough will still look crumbly and dry. Dump the dough onto a clean counter [Make sure to flour your counter so the dough doesn’t stick], and work it with the heel of your hand, pushing and smearing it away from you and gathering it up with a bench scraper and repeating until the dough comes together and is pliable). Turn the dough out onto a sheet of plastic wrap, press it into a flat disk, wrap it in the plastic, and let it rest in the refrigerator for 15 to 20 minutes (or up to four days) before rolling it out. Position a rack in the center of the oven and heat the oven to 350°F. Line a heavy-duty rimmed baking sheet with parchment. Remove the dough from the refrigerator; if the dough is very firm, let it sit at room temperature until it’s pliable enough to roll, 10 to 15 minutes. On a floured surface, roll the dough into a round that’s about 13 to 14 inches in diameter [Make sure you don’t roll it dough out too thin, or else it will be difficult to transfer to the parchment lined baking sheet]. It’s all right if the edges are a little ragged. If you can’t get a roughly round shape, trim the dough so that it’s a rough circle and roll the trimmed scraps back into the dough. Put the apples in a large bowl. Toss the fruit with the 1/4 cup granulated sugar. Taste the fruit; if it’s more tart than you like, add up to 2 Tbs. more sugar. Add the flour, vanilla extract, cinnamon, and salt and toss until everything is evenly mixed. Remove the dough from the refrigerator, and let it sit at room temperature for about 5 minutes to keep it from cracking when you assemble the tart. Pile the apple mixture in the center of the dough round [It will look a bit like a small apple mountain, but don’t worry because it will deflate a little during baking]. Using your fingertips, fold the edges of the dough over some of the apples to create a rim about 2 inches wide [Be careful that the apples don’t poke through the dough. Otherwise your tart may leak too much]. Work your way all around, pleating the dough as you go [Don’t worry too much about making it look too pretty. 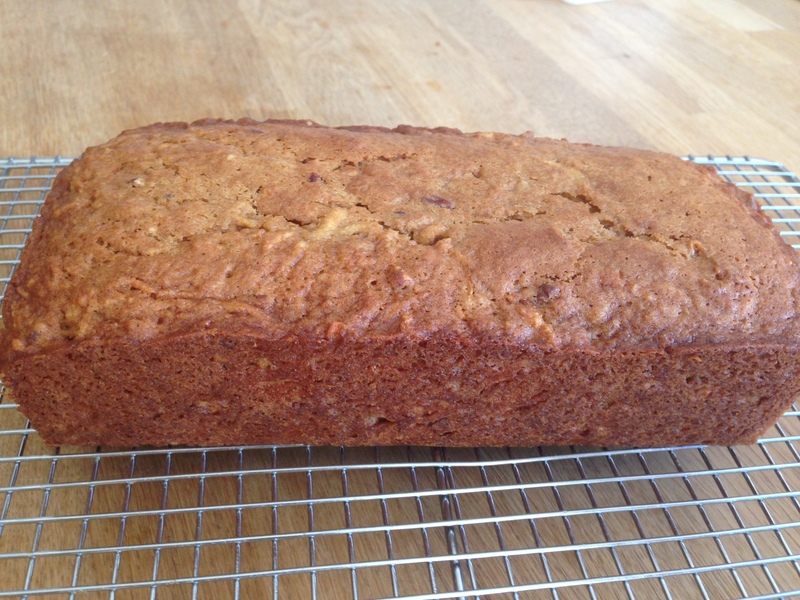 It may look a bit dumpy (“rustic”) before baking, but once baked, it gets better looking]. Using a pastry brush, brush the pleated dough evenly with the beaten egg. Sprinkle the turbinado sugar directly on the dough and fruit. Transfer to a rack and let cool. The tart may be baked up to six hours ahead of serving.